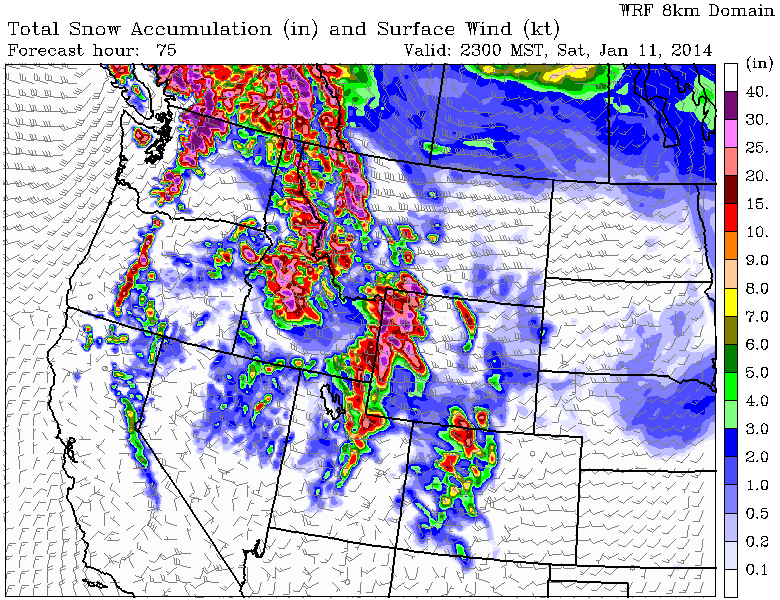 Jackson Hole and the Tetons are going to be in for some decent snowfall the rest of this week. Snow Thursday will get things going with a somewhat weaker storm moving across the Northern Rockies. Then a second storm system that is looking much more powerful, moving across the southern Gulf of Alaska Friday will punch inland for the weekend. The higher elevations of the Cascades of Washington and Oregon stand to get some significant snowfall. The central Idaho mountains will also benefit with some heavier snowfall. In the Tetons of western Wyoming, two-feet or more of snow and between 2 and 3 inches of water could accumulate between Thursday morning and Sunday morning. This will be accompanied by strong winds. And then finish off with a little more snow & wind, and cooler temps, on Sunday. PLEASE be careful to not get so jacked-up for skiing powder in the backcountry that you forget to pay attention to the avalanche conditions. Remember, all this new snow is falling on a weak snowpack, and avalanche danger is going to rise, especially with the wind helping to add additional load those slopes! If you are going to your favorite ski area, please exercise some patience for ski area workers as they may need extra time to open the mountain and make it safe for you. And also highway avalanche control workers who will doing the same this weekend.